Point of View - It Makes all the Difference! 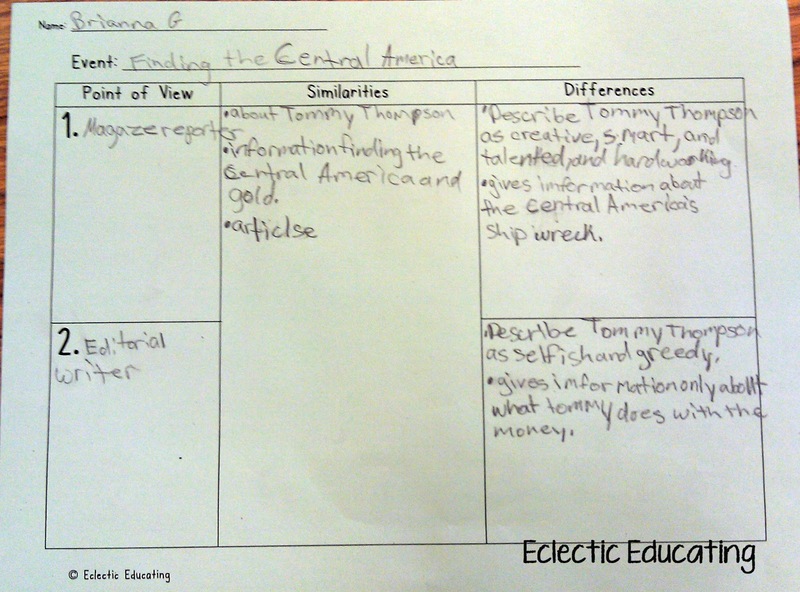 CCSS.ELA-Literacy.RI.5.6 Analyze multiple accounts of the same event or topic, noting important similarities and differences in the point of view they represent. 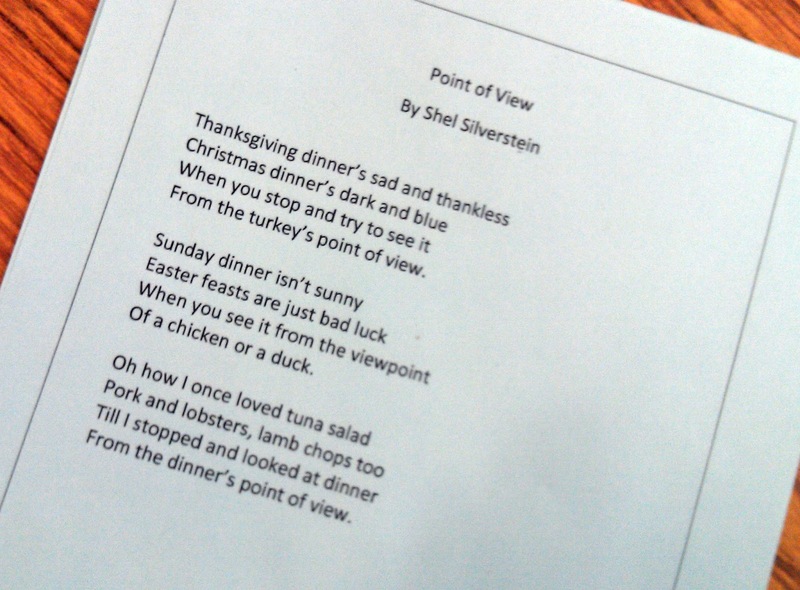 To begin our lesson on point of view, we read Shel Silverstein's poem Point of View. (Click on the image for your own copy!) This poem shows how our meals have a very different perspective on dinner than we do. It is a fun little introduction and gives kids a good laugh. At this point, we also talked about how we often tell different versions of the same story. For example, two kids might have an argument at recess. Each of them tells the story completely different. This also happens with professional writers. 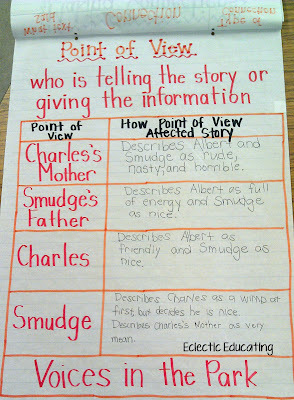 Next, we created an anchor chart that explained the meaning of point of view. I read aloud the book Voices in the Park. This book tells the story of one encounter in the park through four different points of view. 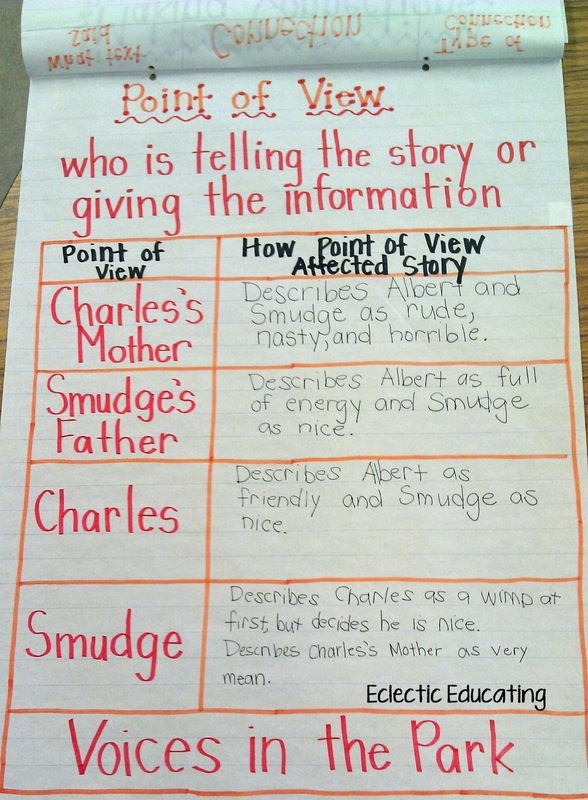 On our anchor chart we recorded how each point of view affected the story. We noticed that the characters portrayed one another very differently in each version. Students glued a copy of the anchor chart into their reader's notebooks and recorded the information as we went along. This provides students with a reference point later when they're working on their own. 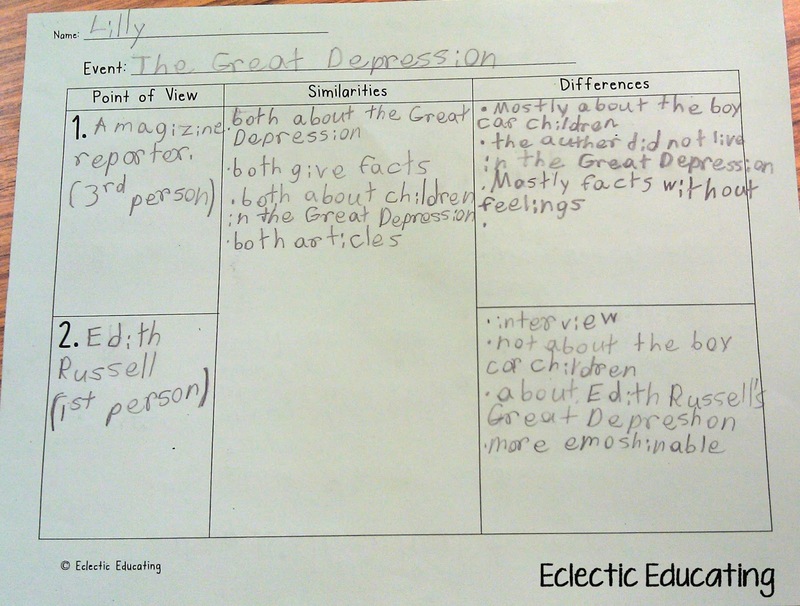 Then, we jumped right in with two articles about the Great Depression. My students were slightly familiar with this historical event. I selected two short articles from Scholastic. One article was an interview with a woman that grew up during the Great Depression, and the other article was about the real "boxcar children." Both articles were about children growing up during the Great Depression, but one was from someone that actually lived during that time. The other was simply created through research. 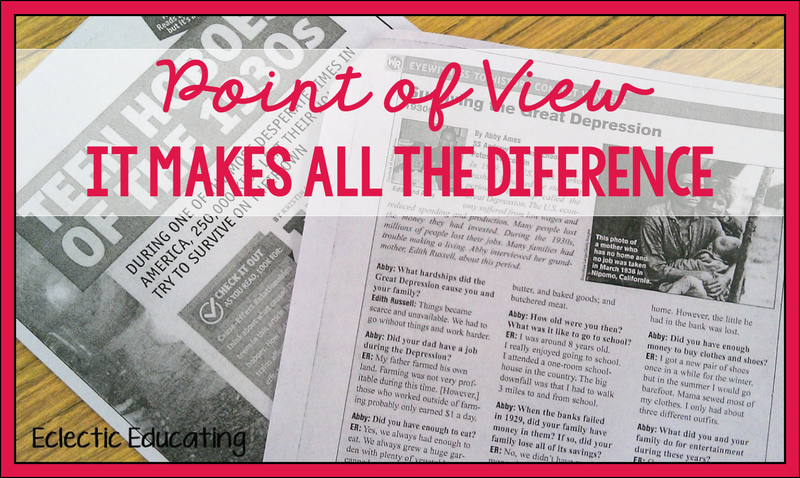 With these articles, we talked about the difference between the perspective of someone who was actually there and someone who was not. One was much more emotional, while the other was simply facts. The next pair of articles was a a big hit with the students. 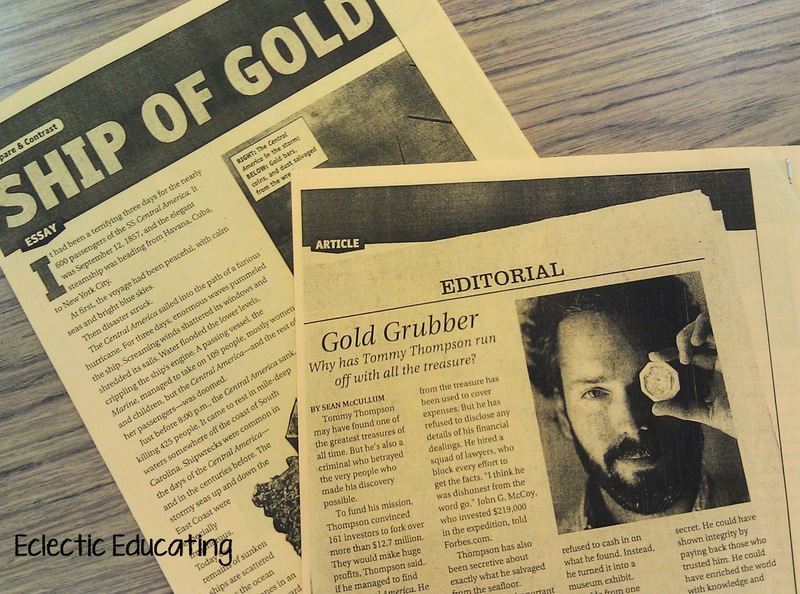 These articles also came from Scholastic, but were about Tommy Thompson's discovery of the shipwrecked Central America and its large treasure. There is a large controversy surrounding the finding of this treasure and who it rightly belongs to. It was interesting because after reading the first article, the students believed Tommy Thompson was in the right. They thought he worked hard and deserved that treasure. (Mainly because this is what the article says.) After reading the second article, they decided Tommy was selfish, greedy, and some even called him a criminal. (It is reported that Tommy has not paid his investors or crew.) After reading both articles, I asked students which author described Tommy Thompson accurately. Was he hardworking, or was he greedy and selfish? After much debate, we decided that he was probably somewhere in the middle. We also wondered if we were missing other important details to the story. After this lesson, my students and I will continue to read texts with a critical eye, carefully considering the point of view of our author. You can't believe everything you read! How do you teach your students to be critical readers? Thanks Amy! My 4th graders are rrally struggling with this. Glad you enjoyed the lesson and materials! I hope it helps your fourth graders! Please let me know if you need any help finding articles! Amy-I love this lesson, and I believe I'll be using it in my classroom too. I appreciate your freebies. I just discovered Newsela.com, and I wonder if a few of articles might work well for this too. Excellent post! Glad you enjoyed the lesson! I have never heard of Newsela.com, but I will definitely be checking it out! Great activity and love the ideas, but it would be more convenient to access resources in Google drive rather than being solicited by docstoc to pay for an account with them. I am very sorry for the inconvenience. I have my entire unit organized together in livebinders. If you would like me to share the entire binder with you, I would be more than happy to. I am just unable to post the links to the articles publicly for copyright reasons. Terrific post Amy - I love your ideas for scaffolding the students through learning about point of view and the graphic organiser! Amy- I loved this post! What a wonderful way to interest point of view with poetry first before jumping into non-fiction articles. I am glad you liked the lesson! I think the poem works out well for an introduction. The kids really loved it! I am looking forward to trying this with my older students. What sites are good sources for articles such as these ? 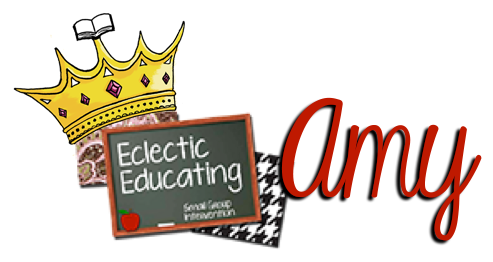 Most of my teachers subscribe to Time for Kids and the Scholastic News so I would want to use something different...Thanks so much Amy ! I really love use EBSCOhost to search tons of articles. This video is a great tutorial for how to use it! http://www.youtube.com/watch?v=F0_Ix9jqyAU I also hear from the other teachers here Newsela is great! Love this idea! I like to have students write the story from a different character's perspective, like the wolf's story from The Three Little Pigs. It is so fun to see what they come up with! I will have to do this with my fourth grade students soon. Thanks for the wonderful post! Thanks Amy! I am working on this with my fourth graders right now and this lesson will fit in perfectly. Thank you for sharing it! Great idea!! Thanks for sharing this lesson. I will have to use it in my class! Great post Amy! I am starting point of view next week and was going to be using Voices in the Park and now I will be using the poem too!! Thanks a million! Love this! 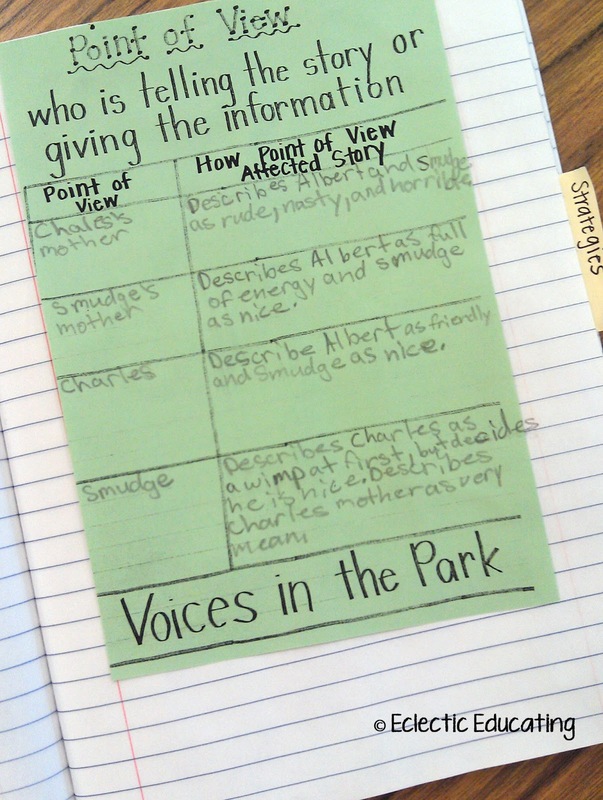 I like using Voices in the Park to book on the writing trait for voice as well.